Beach House on a Budget: Affordable Style Has Never Looked Better! 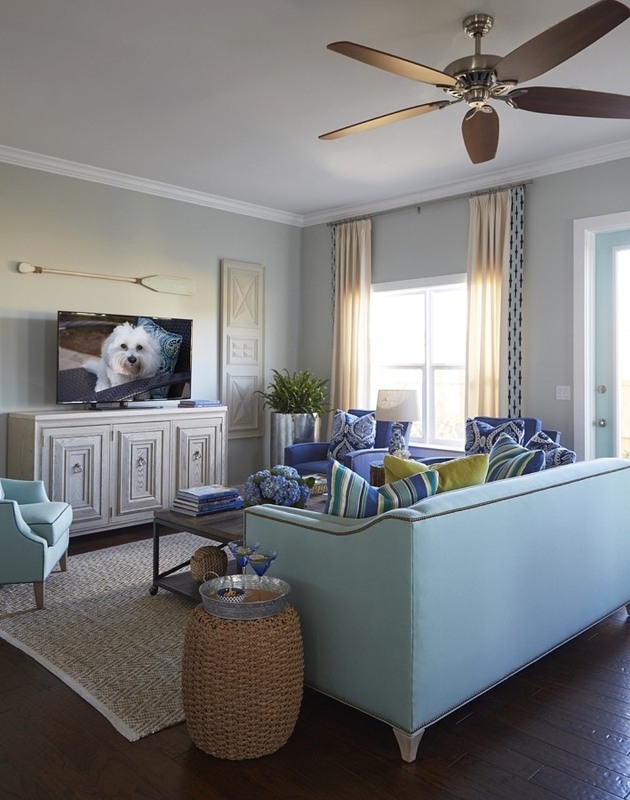 Homeowner/designer Kristin Drohan livened up this single-family house with paint trim the color of sea glass. Their Florida vacation house is a quick walk to the beach, with plenty of restaurants and activities nearby. Kristin added a less-expensive version of shiplap to the front hallway and kitchen as a way to add architectural charm. A sofa and chairs from the designer’s own furniture line add color to the living room. She created a handy coffee table by adding reclaimed wood and casters to a metal frame; the table can be rolled to the side if someone wants to use the sleeper sofa. Kristin combed antiques stores in Destin to find the vintage oars and old doors used as wall decorations. The Drohans were attracted to the location of Gulf Place, which is about halfway between Seaside and Destin, and a quick walk to the beach. The house itself was spacious but needed some custom touches, so Kristin set to work convincing the builder to let her make some changes. First off: add some charm to the kitchen. 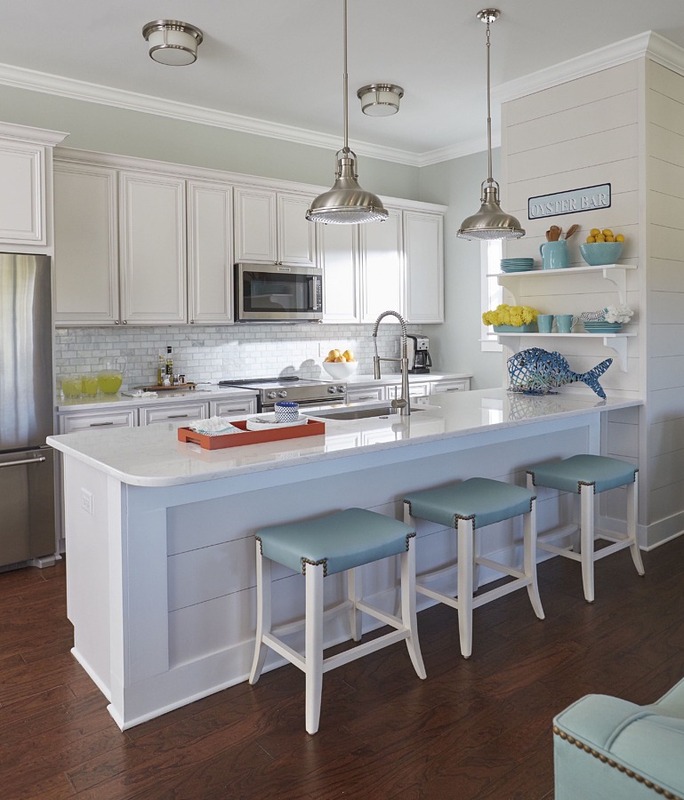 “Our ‘builder-basic’ hall and kitchen needed some architectural interest and shiplap was the perfect nautical answer,” she says. “But I had a budget to consider, so I needed to be creative.” To achieve the shiplap look for less, Kristin had her contractor use plywood sub-flooring instead of pine boards. She also added open shelves along the backsplash and a white quartz countertop to the island as easy upgrades. Her challenge was picking materials that could be obtained right away, since the builder was on a tight schedule. 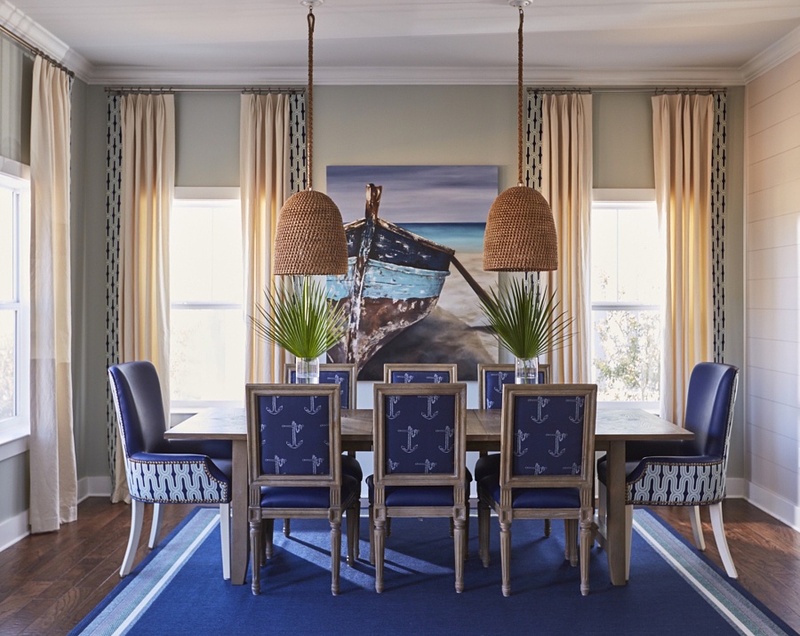 A painting by NC artist Storey Ellis distinguishes the dining room. Kristin used indigo blue faux leather to cover the chairs, with accent fabrics to liven things up. Basket pendants by Palecek add a casual vibe to the room. 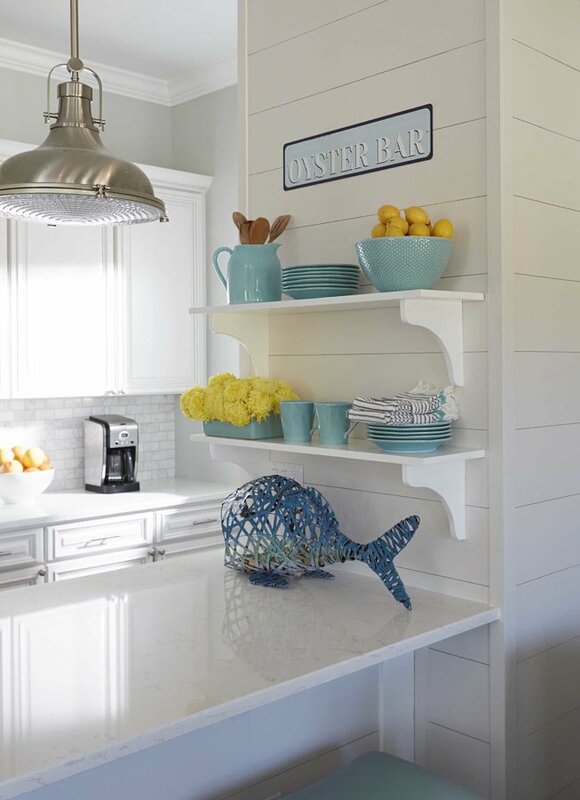 Open shelves gave the designer a place to add colorful accessories to the mostly white kitchen. 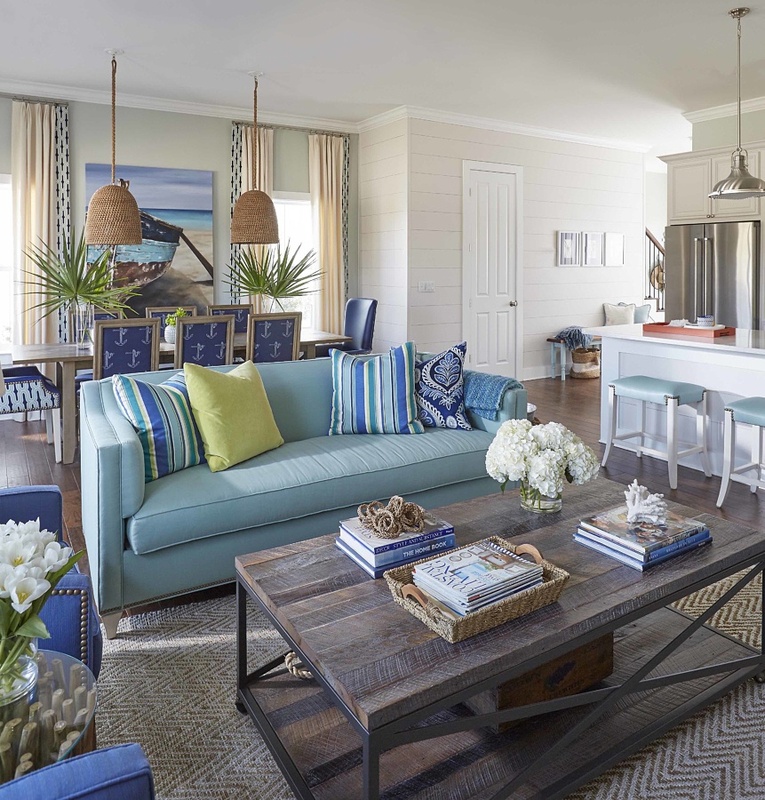 Kristin talked the builder into making some changes to the halfway-built beach house for a more custom look, including wood-planked walls and the marine pendants over the peninsula in the kitchen. 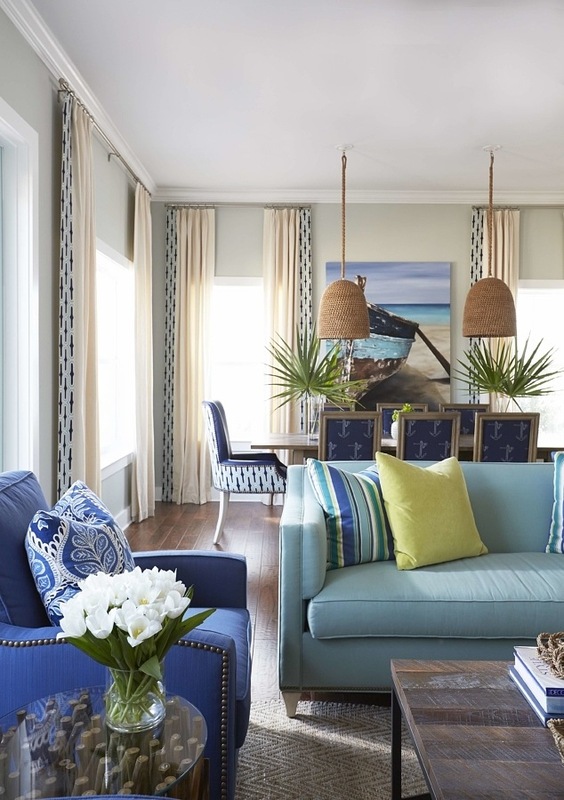 When it came time to furnish the vacation home, Kristin could pull out a big advantage most of us don’t have: she manufacturers her own furniture line, so she could access samples and other insider tricks. “I was able to use every imaginable leftover pillow, lamp, accessory and piece of furniture from showroom vignettes and design-project rejects that I could,” says Kristin. In the living room, for instance, she paired two cobalt side chairs from the KDC line with a sofa and side chair also from her warehouse. 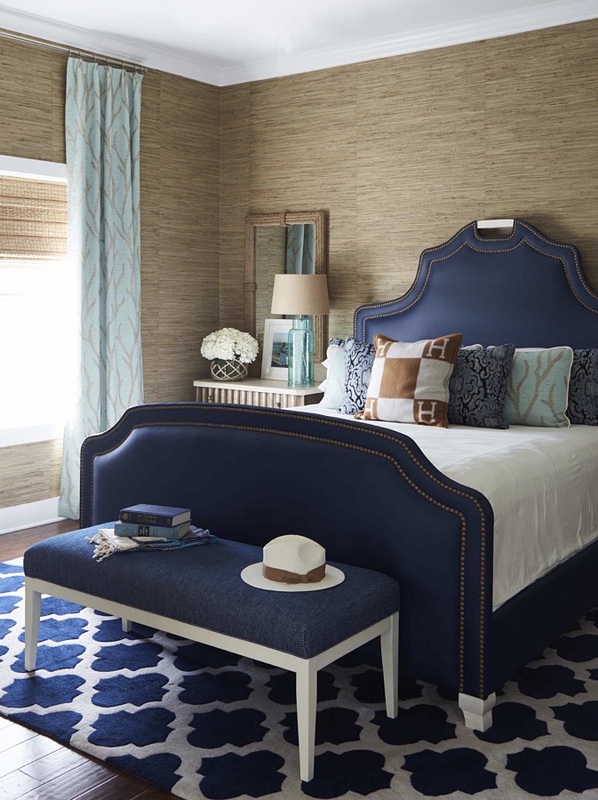 A curvy headboard upholstered in faux leather was a leftover from High Point Market and a great starting point in the guest bedroom. 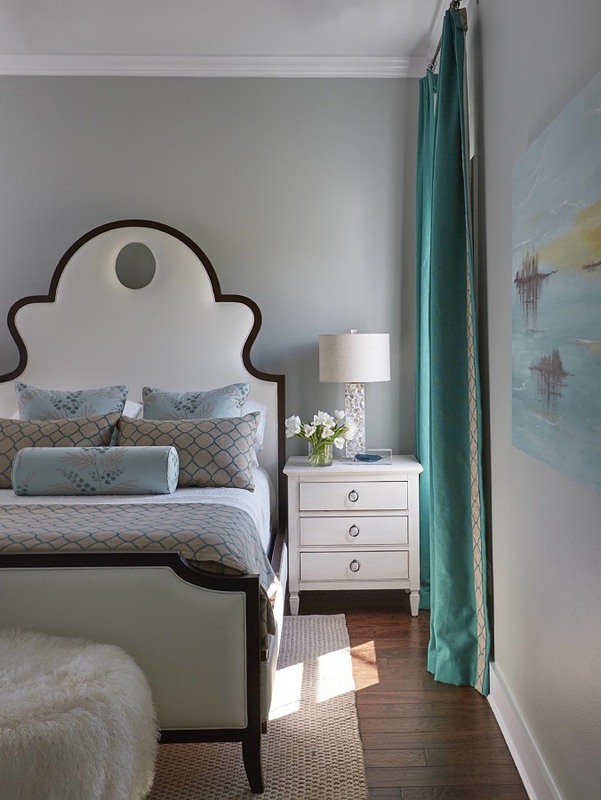 She paired it with teal accessories and a piece of local art painted on wood to add a beachy feeling. 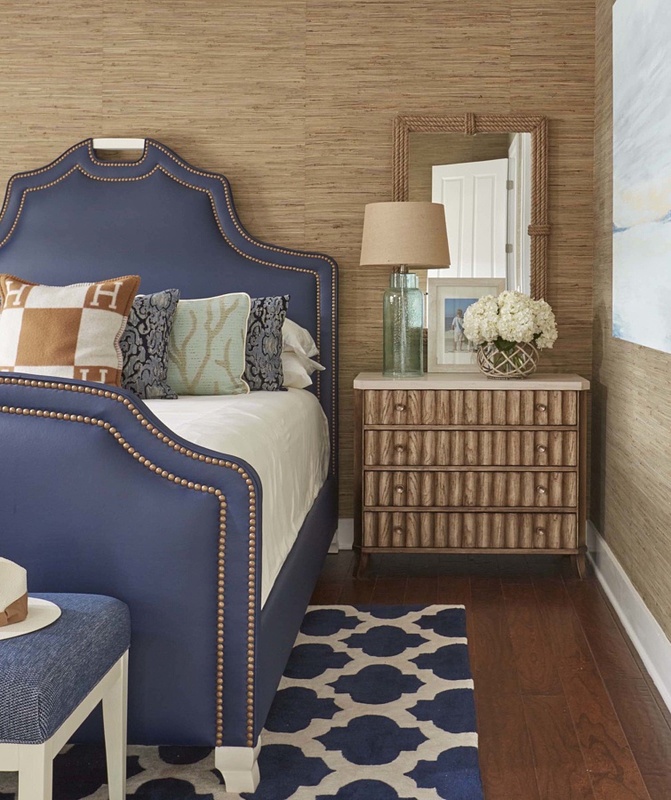 “The splurge in the master bedroom was the grass cloth wallcovering,” says Kristin. “This room needed some personality and texture.” Most of the rugs used in the house are outdoor rugs for durability, but she liked this one leftover from a photo shoot and decided it would be a starting point for the blue-themed room. 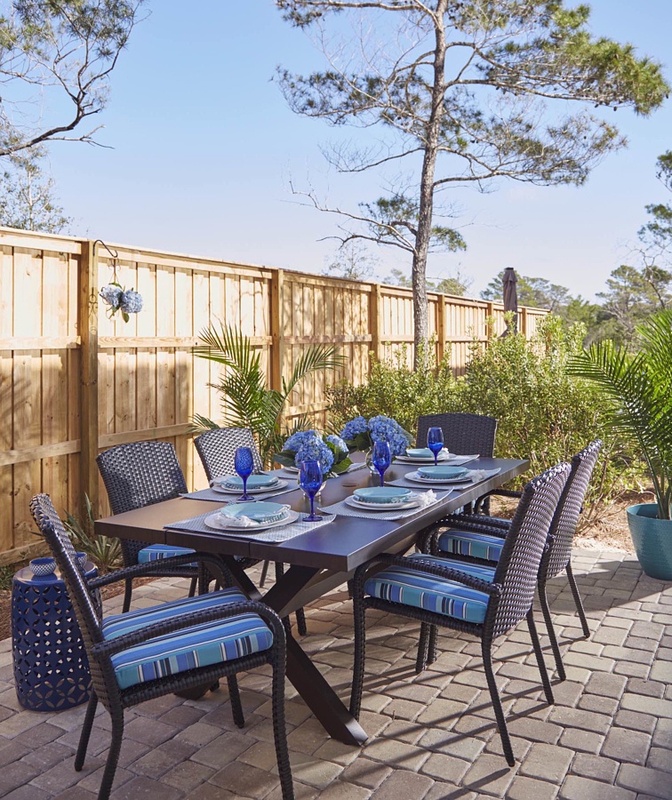 An outdoor table and chairs continue the deep blue color palette. This process propelled Kristin to add a new division to her furniture line, in fact, aptly named the Beach House Collection. Most of her furniture is already available in finishes that seem at home on the coast — such as “driftwood,” “weathered oak” and “gray wash” for the wood, but she’s now also developing fabrics that are both hard-wearing and pretty. “A vacation home at the beach needs to be durable,” says Kristin. “The amount of sand that finds its way inside is crazy.” The faux leather she used on the beach house bar stools and dining chairs can be wiped down with spray cleaner, Kristin points out, and the Sunbrella fabrics on large upholstered pieces can be put in the washing machine. 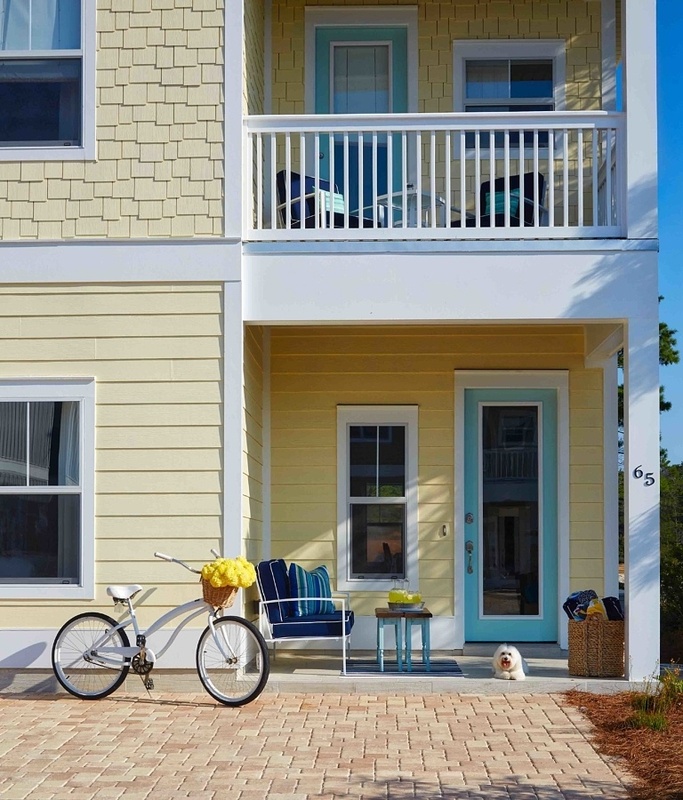 With the house complete, Kristin and her family can get right to enjoying life on 30A: shrimp tacos at La Playa, live music at Growler Garage and checking out the surf. Family life at the beach is everything she thought it would be. “We do feel like we hit the jackpot,” she says. Thanks to Colleen Duffley Productions for today’s beautiful photographs.